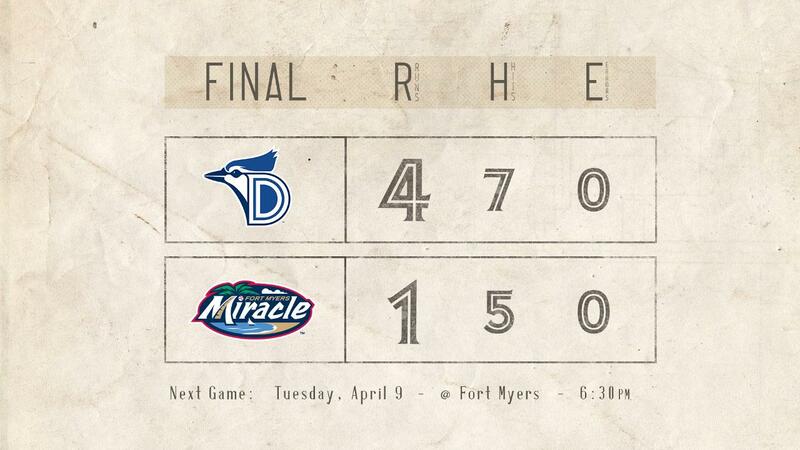 FORT MYERS, FL.---Dunedin continued their momentum from their series win over the weekend and defeated the Fort Myers Miracle by the count of 4-1 in game one of a four game series. The Blue Jays struck first in the top of the fourth when Riley Adams ripped a double to left. Ryan Noda then drove in Adams with a line drive single to right to give Dunedin the 1-0 lead. In the top of the fifth, Samad Taylor was issued a free pass and advanced to second on a wild pitch. Three batters later, Vladimir Guerrero Jr. smacked a single to left to score the speedy Taylor from second to extend the Dunedin lead to two. Cullen Large brought home Guerrero Jr. with a bullet line drive double to center to give the D-Jays the 3-0 advantage. Samad Taylor pushed across the final Blue Jays run of the night with a double to left field to push Dunedin ahead 4-0. Meanwhile, RHP Turner Larkins (1-0) picked up his first win on the hill throwing five scoreless frames and striking out three. Righty William Ouellette gave up the lone run in the game for the Miracle when Travis Blankenhorn ripped his first homer of the year in the seventh. That was all the offense could muster on the night for Fort Myers as RHP Jonathan Cheshire threw two scoreless to record his first save of the year. Dunedin has now won eight of their last nine against Fort Myers dating back to last year and look to continue their string of wins against the Miracle tomorrow evening at 6:30 at Hammond Stadium. Hard throwing right-hander Nate Pearson will be looking for his second win of the year as he starts for Dunedin against RHP Randy Dobnak for Fort Myers.